This innovative dish is a winner in both looks and taste. 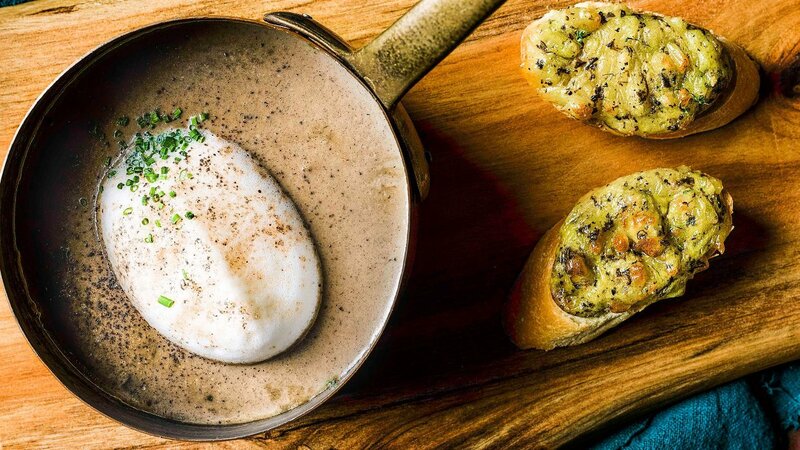 The rich, earthy mushroom cappuccino soup is finished with a milk foam that gives it the appearance of a "cappuccino". Meanwhile, a few slices of truffle cheese toast make the ideal complement. Mix water and Knorr mushroom soup base and bring to boil. Heat up a soup pot, sauté onions and mushrooms until fragrant and golden brown. Add in water and bay leaf and bring to boil. Add in soup base, reduce for 15 minutes and blend until smooth. Add the seasoning and fold in the cream. In a mixing bowl, mix all the ingredients to form a paste. Spread paste onto the sliced baguettes and bake for 6 minutes till golden brown. Season with salt and blend the mixture till foamy. Pour soup to serving bowl. Garnish with chopped parsley and truffle cheese toast.